Pére Benoît, surely the living model for The Thorn Birds' Father Ralph de Bricassart and our host at the tiny 13th Century Chapelle Notre-Dame de l'Ormeau, two kilometres outside the exquisite medieval village of Seillans. The region known as Provence-Alpes-Côte d'Azur. An hour's drive west of Nice, by way of Milan post-the 11-hour Great Circle from San Francisco over Greenland, Belgium and the Alps. The Seillans spell causes one to hate chic Cannes and Monte Carlo, and beg to rush back to the low forested hills and the thousand-year-old farmhouse to sit for hours, without moving, under 500-year-old olive trees. Perhaps, to paint. Oublié le bruit des plages, finie l'agitation touristique... On se mieux, comme lorsqu'on arrive chez soi. Ici, le paysage est d'un calme champêtre: des vignes, des chênes verts, des cyprès, quelques pins encore mais surtout les oliviers. Forgotten the noise of the beaches, no more tourist agitation... One better, as when one arrives at home. Here, the landscape is of a pastoral calm: vines, holm oaks, cypresses, some pines still but especially olive-trees. The unadorned chapel conceals one of the most beautiful rétables in France: a frame or shelf enclosing decorated panels or revered objects above and behind an altar, or a painting or other image in such a position. I worshiped before it, in solitude, as I would a few days later at a cathedral in Old Nice, before a 12-foot masterpiece of Saint Jeanne d'Arc, my patron saint in skirt of mail, carved of a single piece of wood as finely as lace. Every two years, Seillans celebrates the Fête des Fleurs, Festival of Flowers, in which the streets, squares and fountains of Seillans are converted into gardens, exhibitions of paintings, events for children, live music and song, at the gifted hands of local artists. This is a district of handmade fragrances and cobbled medieval streets, of the Tour de France and a sublime work ethic of setting out in the morning for freshly baked baguettes, a three-hour lunch in Matisse's gold sun, a swim, a sleep and dinner at nine with long views to the Mediterranean and the scattering of diamonds of Saint Paul-en-Forêt. 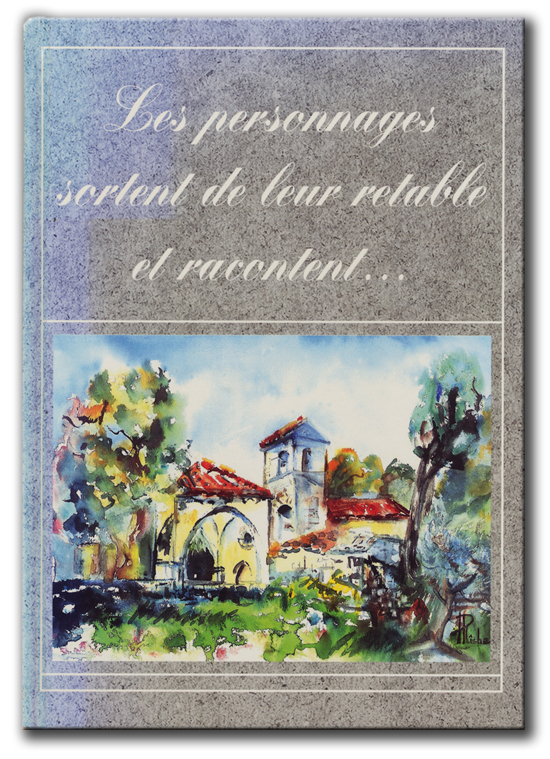 Tout un passé de foi et de beauté surgit devant nos yeux grâce à des aquarelles brossées d'une main d'artiste, chargé d'amour! A whole past of faith and of beauty emerges in front of our eyes thanks to watercolours brushed by a hand of an artist, responsible for love! This, to me, is the pure religion. The religion, yes, of home. He wore a long, plain black cassock and the white collar, carefully-tended black dress shoes. I remember consciously registering the word, pheromone, for the first time in my life, distilling through that solemn male equivalent of a nun's battle armor like the eaux of nearby Fragonard. Perhaps five years later, I learned that Father Benôit left the Faith, that same year, and married a woman. I remember laughing out loud -- mais oui! But yes! In a city-state originating in forgivably expedient negotiations with Mussolini, at the heart of Rome, biretta-topped cardinals -- caretakers of 1 billion Catholics with the recent resignation of Benedict XVI -- gather to mysteriously elect the next Bishop of Rome. The title has nothing to do with the bird; it presumably comes from the Latin cardo, or "hinge" -- perhaps because, one or twice in their lives, each cardinal is a vital hinge around whom the Faith, and politics, have turned since long before Gutenberg's printing press brought the Word to the masses. I sat at Father Benoît's right hand at the head of a long, white table for 40, under a summer-filtering canopy, trying to park my reactive femininity in the feast of paella, believers and friends, deconstructing the functionality of cell phones, then called, to Pére Benoît, Soeur Emmannuelle and a teenage kid. Book cover photo ©2013 Marie Woolf.